In our previous installment (Adding Rows in Incremental Loads – Step 3 of the Stairway to Integration Services) you learned how to make SSIS packages re-executable. You also learned how to build a Data Flow Task so that it only loads new rows. New rows – add rows to the destination that have been added to the source since the previous load. Updated rows – update rows in the destination that have been updated in the source since the previous load. Deleted rows – remove rows from the destination that have been deleted from the source. In this article, we’ll continue to build Incremental Load functionality in SSIS by focusing on updating rows that have changed in the source since they were loaded into the destination. Before we work on detecting changes and updating rows, we need to configure another test. Let’s the same approach as earlier and make changes to rows in the destination table (dbo.Contact). 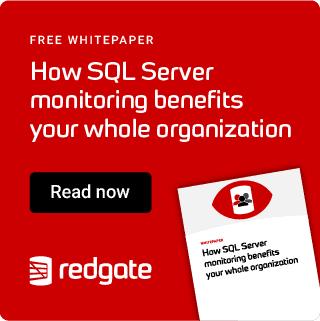 As before, open SSMS and connect to your instance of SQL Server. If you need a review of the steps, scroll up! Execute this query by pressing the F5 key. There are 8,499 rows updated in our destination table. We’ve replaced the NULLs in the MiddleName column for these records with Ray (which happens to be the coolest middle name ever… just sayin’). Click the Columns page. There are a couple table-ish looking grids in the upper right portion of the Columns page. The one on the left is labeled Available Input Columns. This contains a list of the columns entering the Lookup Transformation’s input buffer (remember, the Lookup Transformation is connected to the output off the OLE DB Source adapter – that’s where these columns are coming from). The other grid is labeled Available Lookup Columns. These are columns that exist in the table, view, or query (in our case, a query) configured on the Connection page. In the previous article, we mapped the Email column in the Available Input Columns and to the Email column in Available Lookup Columns. I compare Lookups to a Join; with the line that appears between the Email columns signifying the ON clause of the join. This “ON line” defines the matching criterion that drives the Lookup function. Let’s step back for a minute and review what we have built. The records at the input of the Lookup Transformation flow into the Data Flow pipeline from the OLE DB Source adapter, and are loaded into the Data Flow from the Person.Contact table. The destination table is dbo.Contact and we accessed using a T-SQL query. The Lookup Transformation opens the destination table and attempts to match records that exist in the Data Flow pipeline with records in the destination table. When no match is found, the non-matching rows are sent to the No Match Output. We have altered the configuration of the Lookup Transformation to return values from the Email, FirstName, LastName, and MiddleName columns in the destination table when the Lookup Transformation finds a match between the Email columns in the source and destination tables. These columns are literally added to the Data Flow records as they flow through the Lookup Transformation. The only green Data Flow Path available from the Lookup Transformation is the Lookup Match Output, so we’re not prompted to select the output this time – Lookup Match Output is assumed (correctly). Besides the data they contain, there are other differences between the Lookup Transformation’s No Match Output and Match Output. The most important difference is the columns. We looked at this metadata before, in the last article. The metadata for the Lookup Transformation’s No Match Output is identical to the metadata to the Lookup Transformation’s input. This is by design – the Lookup is simply passing these rows, for which it cannot locate matches, through the transformation. Close the Data Flow Path editor. It’s very easy to spot the additional columns added to the Data Flow Path in Figure 8 – especially since we added aliases to denote columns returned from the Match Operation of the Lookup Transformation. Close the Data Flow Path Editor. In the Adding Rows in Incremental Loads article, we configured the Lookup No Match Output and didn’t see the columns returned from the lookup table – remember? We didn’t need them for incrementally loading new rows, but we need them now so we can compare the column values in the source and destination tables. In this way, we can detect changes. Change Detection is a sub-science of ETL. The method discussed here is a good start, but please keep in mind we’re demonstrating a principle. What does “Match” mean in Lookup Match Output? It means that the Email column in the source table – Person.Contact (which is being loaded into the Data Flow Task via the OLE DB Source adapter) – has the same value as the Email column in the destination table – dbo.Contact (accessed via the Lookup Transformation). We know the Email column values match, but we simply aren’t sure about whether the other columns match. We need to know. If all the source and destination column values match, there have been no changes to the source record and we can exclude it from further consideration. If the source has changed, we want to capture those changes and copy them to the destination. This is the goal of Incrementally Loading updates. There are two parts to this: First we need to detect the differences. Then we need to apply the updates. We’re going to work with Columns, so I’ve expanded the Columns virtual folder in Figure 9. To detect differences between columns in the source and destination tables, we’re going to compare the FirstName, LastName, and MiddleName columns. “Why are we not comparing the Email columns, Andy?” I’m glad you asked! In these rows, the Email columns already match. We matched on the Email columns inside the Lookup, remember? Email is the column we used to JOIN the source and destination tables. So they have to match. That’s ok, we’re not finished. The upper right section of the Conditional Split Transformation Editor contains SSIS Expression Language syntax. SSIS Expression Language is difficult to learn. If you struggle with it, don’t feel bad! A few years ago I wrote a series of blog posts to help you learn your way around SSIS Expression Language syntax. Because the expression in the case Condition field now evaluates to a Boolean value, it validates and the text displays as black to indicate this. What is the case Condition checking? It’s checking if the value in FirstName matches the value in the LkUp_FirstName column for a row of data where the Email columns from both the source and destination tables match. If the FirstName columns are different, there’s a difference between the source and destination. Because destinations typically lag sources, the assumption is the source has newer, better, and more accurate data. We need to get that data into the destination if that’s the case. We next need to add a test condition for MiddleName. But we need to stop and think about what we’re looking for. We’re checking for any difference between source and destination column values. If one change occurs, that’s enough to trigger an update to the destination. If more than one change occurs, that’s fine – one’s enough to trigger the update. So we want to check for inequality between one column or the other. “Or” is the operative word in that last sentence. Again, we’re at a stage where the case Condition validates. The condition tests for differences between the FirstName and LkUp_FirstName columns, or differences between the MiddleName and LkUp_MiddleName columns. Two down, one to go. What have we accomplished? The rows that flow into the Conditional Split Transformation are sent to it from the Lookup Transformation’s Match Output. That means in each of these rows, the Email column contains the same data as the LkUp_Email column – Email and LkUp_Email are the columns used by the Lookup Transformation to perform the Match operation. We configured a Condition in the Conditional Split Transformation and named it “Updated Rows”. The Updated Rows condition traps rows where there is a difference between either (one, some, or even all) of the remaining three column values and their “LkUp_” counterparts flowing into the Conditional Split Transformation: FirstName, MiddleName, or LastName. It’s important to note that the Conditional Split Transformation diverts rows to different outputs. When we defined a condition above, we also created a new output – a new path – from which data can flow out of the Conditional Split Transformation. “Ok, Andy. What about the rows where the source column values are the same as their matching destination column values?” That is an excellent question! If you look below the grid where we just defined the Updated Rows condition, you will see the Default Output Name. This is where rows that match no conditions are sent in a Conditional Split Transformation. We’re going to use the OLE DB Command Transformation to perform the update of rows in the destination table that are different from matching rows in the source table. [Conditional Split ] Error: The expression “(FirstName != LkUp_FirstName) || (MiddleName != LkUp_MiddleName) || (LastName != LkUp_LastName)” on “output “Updated Rows” (115)” evaluated to NULL, but the “component “Conditional Split” (99)” requires a Boolean results. Modify the error row disposition on the output to treat this result as False (Ignore Failure) or to redirect this row to the error output (Redirect Row). The expression results must be Boolean for a Conditional Split. A NULL expression result is an error. The problem appears to be with my expression. Some of the expressions values are evaluating to NULL. Why? It turns out when you test for equality (or inequality) and one value is NULL, the result isn’t True or False; it’s NULL. Since NULL isn’t a Boolean value, the case Condition expression fails. Durnit! Executing these statements tell me all 8,499 MiddleName columns in my source are NULL. When we think about this, it makes sense. We updated the MiddleName columns in the destination earlier where the MiddleName columns were NULL, and there were 8,499 of them. How do we handle NULLs? First we detect them using ISNULL(MiddleName). The IsNull() function evaluates to True or False and is the “condition” argument for the Conditional Operator. The Conditional Operator functions in the following manner: <Condition> ? <True> : <False>. If MiddleName is NULL, the True part of the Conditional Operator – “Humperdinck” in this case – will be applied. If MiddleName is not NULL, the False part of the Conditional Operator – MiddleName in this case – will be applied. So if MiddleName is NULL, we replace it with the value “Humperdinck” for comparison purposes. If MiddleName is not NULL, we simply compare the value of the MiddleName column. The same logic applies to the LkUp_MiddleName column – if the value is NULL we replace it with “Humperdinck”; if not, we use the non-NULL value for comparison. In this way, we avoid attempting to evaluate the expression NULL != NULL – which evaluates to NULL and raises the error we saw earlier. One important thing to note here: “Humperdinck” can never appear as a valid MiddleName value in our data – ever. Consider what would happen if the name data was loaded with no middle name supplied; John Smith, for example. Later, John updates his name information online or while chatting with a Customer Service Representative. What happens if John’s middle name is Humperdinck? The value stored in our destination table is NULL. The source table has just been updated from NULL to Humperdinck. When the Conditional Split Updated Rows condition is applied to this row, it evaluates the MiddleName side of the inequality comparison (!=) as not NULL, and therefore uses the middle name (Humperdinck) for comparison. The LkUp_MiddleName side of the inequality comparison (!=) evaluates to NULL and replaces it with “Humperdinck” for comparison purposes. The inequality comparison works as designed but fails to identify these values as different. Oh no! I use “Humperdinck” for middle names in my demos and writing because I really like The Princess Bride. In real life, I use a combination of numbers, letters, and a couple hard-to-accidentally-type characters from Character Map to form the word to replace NULL values for comparison. Why does this take so long to execute? Most of the execution time was taken executing the update statements in the OLE DB Command. Why? The OLE DB Command processes a single row at a time. It’s the equivalent of an SSIS cursor, and SQL Server just doesn’t like row-based operations. They execute slowly. Right-click the OLE DB Destination and click Rename. Change the name of the OLE DB Destination to “StageUpdates”. Double-click the OLE DB Destination to open the editor. Ensure “(local).AdventureWorks” is selected for the OLE DB Connection Manager. Accept the default Data Access Mode of “Table or View – Fast Load”. We’re going to make some edits before hitting the OK button, but how cool is this? The table name came from the name of the OLE DB Destination – that’s why we renamed it first. The columns Data Definition Language (DDL)? That was read from the Data Flow Path’s metadata – and it includes the data type conversions from SSIS data types (DT_WSTR, for example) to SQL Server data types (nvarchar). I ask again: How cool is that? The columns are auto-mapped because the column names and data types match. They match because the Available Destination Columns were built from the Available Input Columns’ metadata. We’re going to execute a set-based update in this Execute SQL Task. I remember when I learned this syntax – it’s awesome! Rather than loop through the record one at a time, this applies the updates to the destination table almost all at once. Don’t believe me? Wait until we check those runtimes! 1.419 seconds is better than over 3 ½ minutes! We still need to manage the StageUpdates table some more. The current configuration will continue to stack records to be updated in the StageUpdates table forever. That has to change. What we could do is delete the records from StageUpdates after we apply the updates to the dbo.Contact destination table. Here’s why I don’t: If something “bad” happens during execution, having these records hanging around between executions allows me one more data point to check for clues. Because of this, we’ll truncate the table before the Data Flow Task loads the table – leaving the records in the StageUpdates table between executions. Cool? In this article, we started with an SSIS Incremental Load that would successfully load data if there were no changes to existing data stored in the destination. This is a valid use case for data like the high temperature for a given date or currency exchange rates at the end of a day. Some data, however, changes over time. To capture these changes, we need to detect differences between the source and destination and apply updates to the destination. This article covered a couple ways to accomplish the updates; one remarkably faster than the other. Next up: deleting rows from the destination that have been deleted from the source. Learn about the very basics of what Integration Services is and how it’s used in SQL Server. Learn how to dynamically load data from ETL load files using SSIS as a shell. The code downloads files from FTP, parses them and loads them into the database. In this article, Zach Mattson shows us how you can set up SSIS to handle multiple application environments and easily move packages from development to QA to production. In February 2008, Microsoft announced a record-breaking data load using Microsoft® SQL Server® Integration Services (SSIS): 1 TB of data in less than 30 minutes. That data load, using SQL Server Integration Services, was 30% faster than the previous best time using a commercial ETL tool. This paper outlines what it took: the software, hardware, and configuration used. We will describe what we did to achieve that result, and offer suggestions for how to relate these techniques to typical scenarios. Even for customers who don’t have needs quite like this benchmark, such efforts can teach a lot about getting optimal performance.